In group decision making, having a seat at the table is different than having a voice, especially for women. 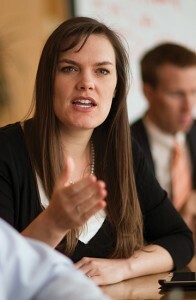 Scholars at BYU and Princeton examined whether women speak less than men in a group collaborating to solve a problem. In most groups studied, women’s speaking time was significantly less than their proportional representation. Women, when outnumbered, spoke as much as 75 percent less than men. Men, on the other hand, experienced no participatory deficit when in the minority. “Women have something unique and important to add to the group, and that’s being lost . . . under some circumstances,” says political science professor Christopher F. Karpowitz (BA ’94, MA ’96), lead author on the study. The findings were published in the top academic poli-sci journal, American Political Science Review. For their experiments the researchers recruited groups of people to discuss the best way to distribute money earned in a hypothetical task. Half of the groups were instructed to decide by majority rule, the other half by unanimous vote. Only when the decision had to be unanimous did the time inequality in women’s participation disappear. The results suggest that a consensus-building approach is empowering for women when they are in the minority—a takeaway that study coauthor Tali Mendelberg of Princeton says applies to many settings. Notably, the groups in the study arrived at different decisions depending on the women’s participation: women often swung the group’s stance on how much money to distribute to the lowest member of the group. “We’re not just losing the voice of someone who would say the same things as everybody else in the conversation,” says Karpowitz.